Improve packing/quality exaltation/packing speed/save materialTension 0~250%/atrophy < 5 % Pre-stretch： Tension range 0-250% to save film material. Self-protection switch： When plant is in abnormity, the film carriage reach the top or bottom to protect from collision. Photocell device： The height of packing product is detected by sensor to track best packing height for each product. Tension control： A mechanical flexible braking is applied for film tension control to get perfect protection for product. Break film automatically：Break film automatically to save time after finish packing（Weight should exceed 250KGS） Special design Ⅰ：12 rollers to be 2 group in certain angle to uphold steadily and run smoothly.Special design Ⅱ：Adopt mighty belt in replacement of chain for conveying to reduce noise and eliminate potential trouble caused by chain‘s break, patent buckle design ensure safety of film carriage.Special design Ⅲ：Traditional hatch is ahead and easy trip by touch, and the weight is always in the back,so we make the hatch in the back convenient for movingSpecial design Ⅳ：Chassis is in integrative ”U” model and close to the turntable ，So the equipment willnot be damaged because of the film jammed in the turntableSpecial design Ⅴ：Integrative arch design for pillar perfect the design and facility enfolding design makepersonal installation come true and make it safe to move and install. Special designⅥ：Electric parts are original imported and equipped with aero socket, easy for maintenance. 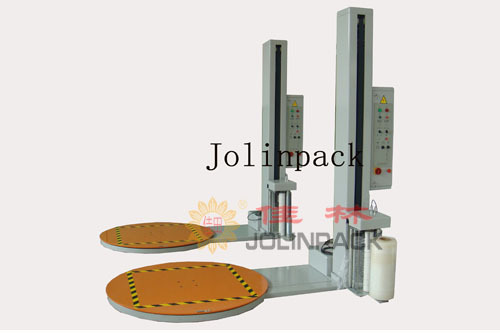 Special designⅦ：Optional mechanical and electromagnetic film carriage、remote-control device、pulley ramp available.